Let us guide you around this fantastic piece of coastline and experience the sea in a whole new way! Coasteering in Cornwall is an incredible, out of the ordinary adventure you can enjoy with almost anyone. Discover the Newquay coastline like you have never seen and join us for an adventure filled Coasteering session in Newquay. 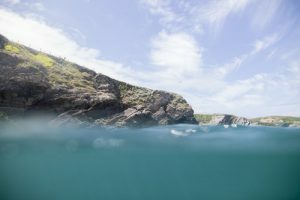 Challenge yourself to daring deep water jumps, traverse along the water’s edge, (easy) rock climbing, and explore whirlpools, gullies and caves as you experience the beautiful coastline up close by wild swimming. From only £40.00 per person, Explore all the wonders Newquay’s coastline has to offer! Whatever your ability, experience or group type we run daily coasteering sessions in Newquay to suit your needs. Check out our highly rated & reviewed Coasteering sessions for the best adventure in Newquay. 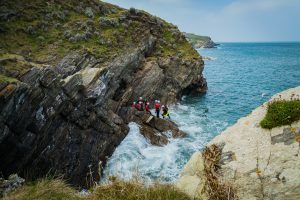 The stunning and rugged coastline in Cornwall and particularly around the Newquay area provides the perfect environment for our Coasteering adventures. Let us guide you around this fantastic piece of coastline and experience the sea in a whole new way! Our guides know the best coasteering routes so you can be sure you will be having a safe and fun adventure. We also follow eco coasteering guidelines to ensure Coasteering in Cornwall is kept sustainable. What is Coasteering? Do I need to be fit for Coasteering? Where will I go Coasteering? Visit this page to find the answers. Newquay Coasteering sessions! Join now. We provide safe Coasteering sessions in Newquay! All of our Coasteering sessions are delivered by highly trained and qualified staff. Enjoy Coasteering in the Newquay coastline with our surf school. To find the best Coasteer Sessions in Newquay. Here at Cornish Wave we always like to reassure and set any nerves at ease, right from the start. The great thing with Coasteering which makes it accessible for all, is that you can make it as easy or as challenging for yourself as you wish. We have all walks of life joining us and you’ll be taught all the skills you need and by keeping our groups small this ensures a memorable experience with us. 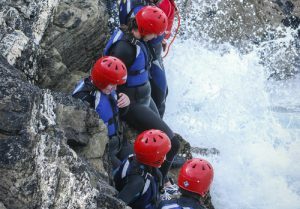 Coasteering is a fantastic blend of adrenaline, adventure and exploration that can be tailored to all ages and abilities. 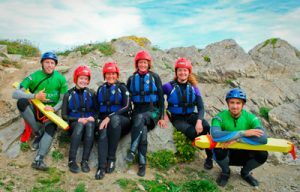 With experienced guides to lead and support your group you’ll be loving the unique excitement Coasteering brings in exploring the Cornish coastline. To check our availability and to book your adventure please get in touch. We’d love for you to join us. All sessions comprise of several elements such as entering and exiting the water from various heights, wild swimming, low level traversing, sluices, cave exploration, deep water jumps and more. Depending on the sea state and the groups individual aspirations and skill level will dictate on much of these elements can be covered. A safe session of coasteering can be the ultimate adventure activity for your holiday in Newquay. The majority of people of join us have never Coasteered before. We’ll explain everything and teach you all the skills you need to have a fantastic experience. You do not have to be a strong swimmer. We ask that you can swim a minimum of 25 metres. We have people from all walks of life join us. You will also be wearing a buoyancy aid to assist you in the water. You will need to bring something to wear under the wetsuit we provide, a pair of lace up trainers that you don’t mind getting wet and a towel. If it is sunny we recommend suncream and a bottle of water. WHAT AGES IS COASTEERING SUITABLE FOR? The minimum age to join a group session is 8 years old. For children younger than 8 we ask you book a Private session for just you and your family. WHAT IS THE HIGHEST JUMP? The highest jump will depend on both the individuals jumping ability, the sea state and the overall needs of the group. We will endeavour to help you pursue your boundaries and coach you to reach our maximum jump height of 10 metres. WHAT IF I DON’T WANT TO DO SOME OF THE JUMPS? You will never be asked to do something you don’t want to do. You can do as much or as little as you like. We will always tailor the session to suit both the individuals and groups needs. WHAT IF I DON’T LIKE HEIGHTS? Challenge by Choice. We will always ask that you try to push your boundaries by building confidence whilst with us in a safe environment. However if even the smallest heights just isn’t for you there are always other options. You do not have to do anything you don’t want to do and we certainly won’t make you climb anywhere that makes you feel uncomfortable. DO YOU DO OTHER ACTIVITIES? Yes, at Cornish Wave we offer a range of amazing adventure activities such as surfing and wild camping to take advantage of Newquay’s fantastic location. We cater for all abilities and confidence levels from beginners, to families and we want to make sure you enjoy yourselves! We don’t offer activities such as sea kayaking but with our range for brilliant activities you are sure top have a great time! Our Surf lessons Cornwall are second to none! 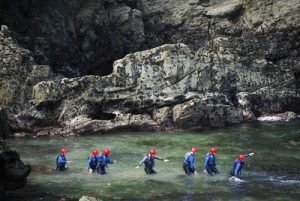 Our instructors have years of experience operating on the Newquay coastline, giving you the best possible activity days. Our commitment to high standards is reflected in our consistent excellent rating as reviewed by our customers on Trip Advisor. Located in the heart of Newquay just a few minutes walk from either of our surfing beaches, coasteering location or surf shops, cafe’s and bars.